Features 36 rooms overlooking the ocean lagoon and nearby islands. Rooms range from standard class to deluxe rooms with kitchenettes, and a penthouse suite on the roof deck with a large private veranda, whirpool bath, kitchenette, and plenty of spacious living area. West Plaza By the Sea also features the Red Rooster Cafe. The cafe offers a wide selection of Japanese Cruisine, open for breakfast, lunch and dinner. The nightly happy hour features Palau's only locally brewed beer on tap, Red Rooster Draft. 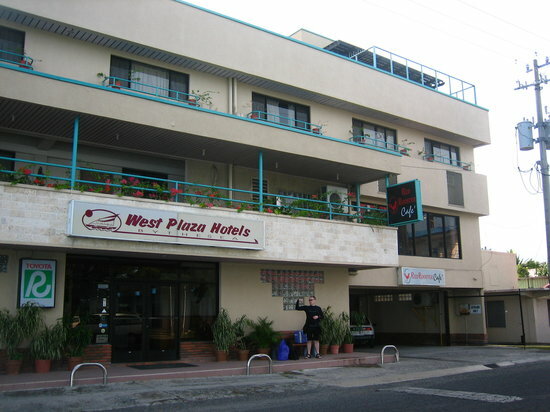 West Plaza By the Sea also offer rental car service, Toyota Rent a Car, located at the lobby of the hotel. It opens daily from 8 AM to 5 PM also during flight arrival and departure time. Toyota Rent a Car offers a wide range of vehicles from economy class to full size sedans. For the truly adventurous, 4X4s and SUVs are also available. Rental car reservations can be made through our central reservations. "Great hospitality and staff. They held our luggage while we waited to check in (you arrive early in the morning). They also watched our bags, since you have to check out before the boat arrives. Rooms were excellent. We stayed in a studio (cheapest option), but it was really nice and worth the money. Maybe next time will go for an upgrade."